As author Eric Bradley explains in the Picker’s Pocket Guide to Signs, the popularity of certain types of advertising signs has increased exponentially since the early 2000s. One thing the most valuable signs have in common is that they are “fresh to market.” That is, they’ve recently been discovered in a forgotten stash somewhere and they’re being offered on the secondary market for the first time since they were new or purchased by a collector decades ago. Rarities also command more attention since they don’t come to market often. Bradley reports that the current world record price for an advertising sign is $165,000. That sum was paid in 2011 for a Rock Island Railroad reverse glass sign. “The sign was made in 1890 by an employee of the firm and is believed to be the first sign made for the railway company,” reported Bradley. But that doesn’t mean that there aren’t some consistently good selling categories of signs, whether they’ve been sold one time or a thousand. Among these are breweriana and petroliana, along with varied types of food and drink signs. Breweriana basically refers to any type of memorabilia related to beer. This includes, of course, beer signs. 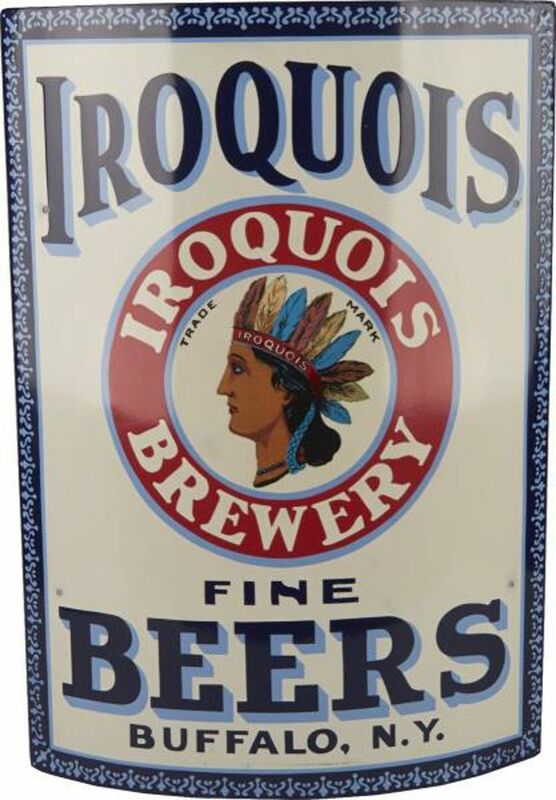 The corner sign measuring 24 ½-inches tall shown above advertising Iroquois Beer sold for $7,500 (not including buyer’s premium) at Morphy Auctions in May of 2015. It has been professionally restored by Lane Christensen. Had it been in all original condition and excellent as it is now, it would have likely sold even higher. How Much are Old Beer Bottles Worth? The term petroliana references antiques and collectibles relating to gas stations and all the related brands of products that would have been marketed through them. Signs displayed promoting anything related are desirable to both general advertising and petroliana enthusiasts. The porcelain sign above advertising Standard Oil’s Red Crown brand of gasoline sold for $950 (not including buyer’s premium) at Morphy Auctions in May of 2015. The color on the side shown is more vivid than the reverse, and there is one small chip in the porcelain along the edge. Had it been in excellent front and back, it would have likely sold for an even higher price. A wide variety of food and drink advertising signs appeal to collectors. Some are novel featuring brands no longer being made. Others are desirable for their familiarity with today's consumers, especially when rarities emerge. As a subset, soda collectibles find favor with many memorabilia buffs. Drilling down even further, some folks specialize in one brand like Coca-Cola. The Campbell’s Soup curved porcelain sign measuring 22 ¼” high shown here sold for $2,750 (not including buyer’s premium) at Morphy Auctions in January of 2015. The condition of this sign is conserved to be near mint, thus contributing to the handsome selling price. It’s no secret that Coke is king when it comes to soda-related memorabilia, and we’ll explore that a bit more in the next slide. However, there are many other types of soda collectibles that hold favor among aficionados including Dr. Pepper, Moxie, and Pepsi among many others. 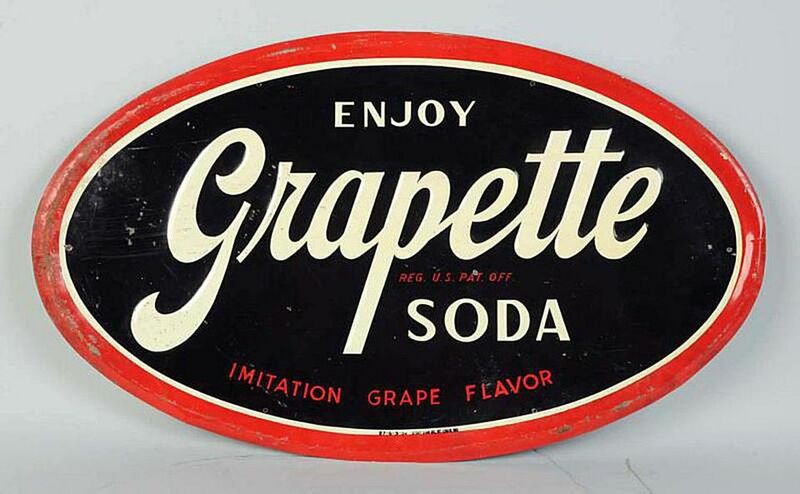 The Grapette sign shown above sold for $425 (not including buyer’s premium) at Morphy Auctions in July of 2015. It has some scratching around the edge and a few nicks to the surface, or it would have likely brought even more at auction. Are NuGrape and Other Brands Valued as Highly as Coca-Cola? Yes, as a familiar brand that is still marketing products the world over, Coca-Cola memorabilia is quite appealing to collectors and the most popular among soda branded collectibles. Everything from button signs in varied sizes to life-like bottles holding thermometers, there’s not a Coke sign out there that won’t find a home in a collection. Learn more about Coke memorabilia reading Coca-Cola Gum Rarities, Coke Collectibles Price Guide, and Who was Hilda Clark?